Welo bars are a healthy and yummy addition to any christmas stocking, perfect for making your gut happy during a very indulgent holiday season. Welo makes bars for adults and kids, as well as delicious probiotic and apple cider drinks that are perfect for the holidays and the new year! Makeup is definitely a good item to include for the makeup lover in your life. It’s always handy to receive a staple item like a classic black mascara, or black eyeliner, or you could even include some makeup removing wipes or cotton pads. I’ve noticed that this item is something that not many people buy for themselves, at least all the hair brushes I’ve ever gotten have always been a gift and I’ve found it to be very useful. I recommend finding a “Wet Brush” like the one in the photo because it is more versatile in it’s use and can be found pretty much anywhere. This is definitely for the coffee lover in your life. Check your local favourite coffee spot and see if they have any seasonal roasts or blends. It’s the perfect item to crack open right on christmas morning and enjoy right away with family while opening gifts. Trust me, you don’t realize how handy these items are until you have one. Surprise someone with a great brand like PopSocket because it’s good quality and will last much longer than the knockoff brands. They have plenty of styles and designs to choose from so you can find the perfect match easy! 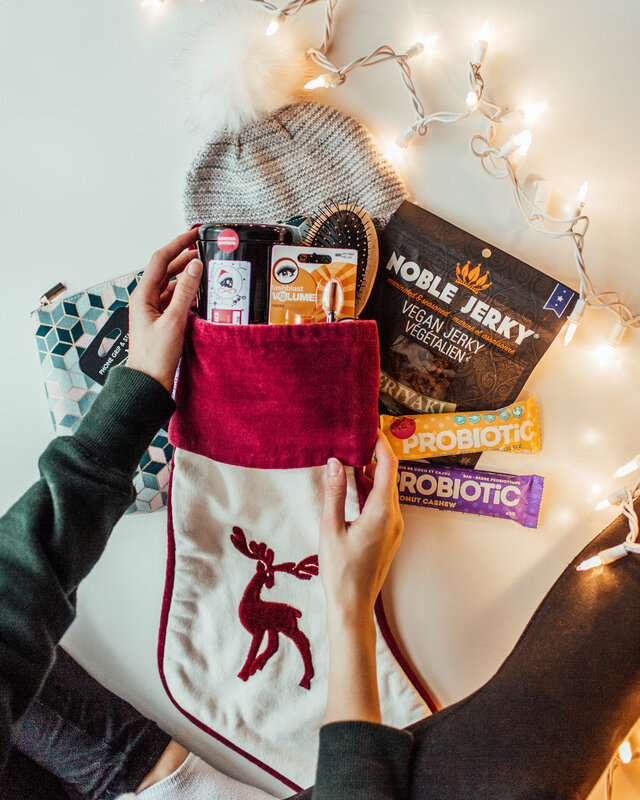 This is pretty self-explanatory, snacks are always a MUST in a christmas stocking stuffer and vegan snacks are just that much better (I may be bias here) They’re pretty easy to come by these days, and honestly you don’t miss out anything that would have been in a “regular” snack. Try a fun vegan jerky like in the photo, some delicious chocolate bark, or flavoured nuts! Hats and toques are perfect for the winter season and in are basically a necessity where I’m from - I’m also a firm believer that you can never have too many hats for the winter. Surprise someone with a good quality toque, or cute style that they can wear all season long. Little pompoms on top just add to the holiday spirit!